Being aware that a huge part of German graduates in natural science and engineering disciplines follows a career path in industry. We want our MSc students to get deep insights in leading companies of the O&P industry during their studies. Each year we offer our students the chance to see behind the curtain of greats of the O&P industry. 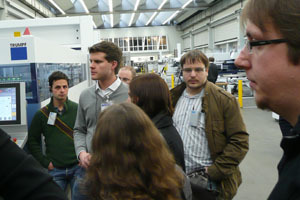 These excursions usually combine three parts: In company tours the students are presented the companies products as well as production halls and processes. During speeches of representatives they are introduced into the companies history, their ambitions and future projects. Afterwards, there is some time for face-to-face discussions on new advancements of the O&P, deeper questions to the company as well as on career paths at the company.